In the end it was a day with a fairly decent tally of commoner migrants but nothing in any great numbers until mid-afternoon when large numbers of Swallows began departing to the south-east. 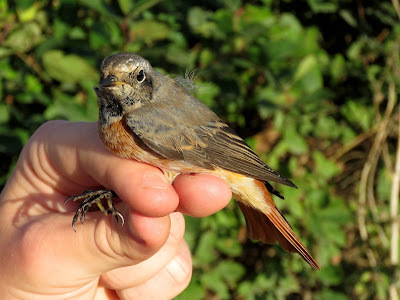 Of note among the grounded migrants were the first two Firecrests of the autumn, nine Blackcaps, eight Lesser Whitethroats, six Spotted Flycatchers, two Redstarts, ten Whinchats and two Pied Flycaychers. Overhead migrants included a flock of seven Common Buzzards, 45 Yellow Wagtails, six Grey Wagtails and two Tree Pipits. A Little Owl was also heard in the Desert. There were four Arctic Skuas and a Black Tern feeding offshore where a Common Sandpiper flew west.. In flat calm conditions this morning an excellent count of at least 32 Porpoises was made and a Grey Seal was also seen. An early evening check produced two Sickle-bearing Bush Crickets and lots of Tree Crickets singing.